1. Fort Wayne’s Arts United Center is the only performing arts center designed by the famous architect, Louis Kahn, and it is also his only building in the Midwest. Kahn’s original concept of the arts campus in Fort Wayne was modeled after the Lincoln Center in New York City, but the project was constricted due to lack of funds. Arts United hopes to one day achieve Kahn’s dream in their Arts Campus Master Plan. When Arts United issued an RFP for needed upgrades to the building, 36 architecture firms visited over a three-week period from all over the world to see the building! 2. Fort Wayne’s Arts Campus draws over 500,000 visitors every year! To put that into context, that is more than the TinCaps and just under the Fort Wayne Children’s Zoo. This demonstrates the region’s interest in and support for arts and culture as an entertainment amenity for themselves and their family and friends. 3. Fort Wayne’s Arts Campus will connect to The Landing and Riverfront Development. This collaborate will create a cohesive and holistic downtown experience with many ways to spend your time. This will be a safe, walkable and bike-able corridor like many of our larger-city neighbors have. 4. Fort Wayne’s Arts Campus has many opportunities for youth education in the arts. Most of the co-located organizations at Arts Campus Fort Wayne offer educational arts classes, including the Fort Wayne Ballet's Auer Academy, the Youtheatre's semester classes, Fort Wayne Museum of Art's Art Club, and Fort Wayne Dance Collective's classes. FAME provides exhibition opportunities through the FAME Festival. Youtheatre shows are put on by kids for kids, and the Fort Wayne Ballet Youth Company performs half-hour productions of works like It's the Great Pumpkin Charlie Brown. Cinema Center hosts a family film series during the summer. 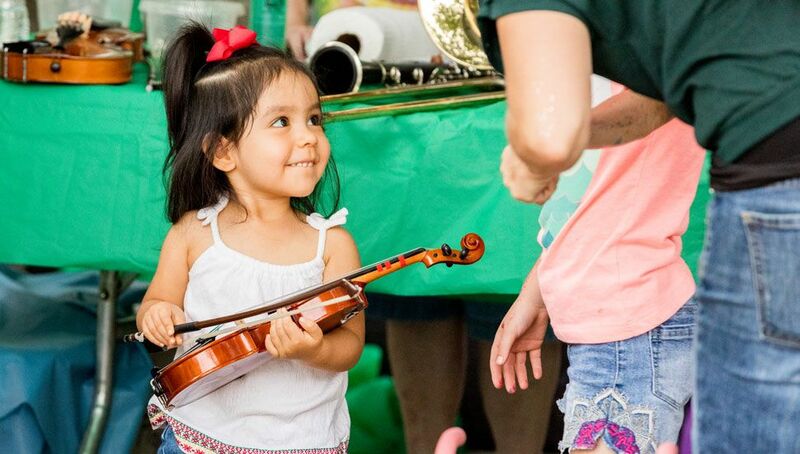 Arts United's annual Taste of the Arts Festival is geared towards families on Saturday of the festival, with free kids activities hosted by nonprofit organizations. 5. You can get involved! There is a breadth of volunteer opportunities across the 12 co-located arts and culture organizations on the Fort Wayne Arts Campus. All of the organizations host opportunities to get involved, whether that's using professional knowledge by serving on a board or committee of an organization, donating time to usher for dance, music, and theatre performances at one of the venues, or working at one of the many summer events and festivals as a guide or information booth. It's notable that all of the actors for the Fort Wayne Civic Theatre are also volunteers.